Exploding Glass Cookware & Bakeware – Should We Be Concerned? Glass bakeware, cookware and food storage containers like these Pyrex bowls is something commonly found kitchens across America. Believe it or not, glass cookware from Anchor Hocking and Pyrex has been classified as a potential household hazard. 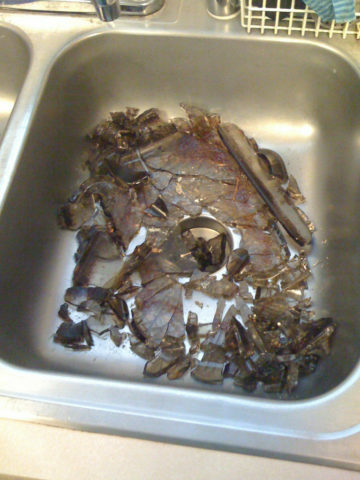 It’s said that exploding glass cookware can send razor-sharp shards of glass flying in all directions, creating the possibility of serious (and permanent) injury to anyone within a few feet of the explosion. Exploding glass makes great headlines, but what’s really going on here? Technically, “exploding” isn’t what’s taking place here. The more correct term is “shattering“. Indeed, glass can shatter when it strikes (or is struck) by something, or if there is a defect in the glass such as a chip or crack. A difference in thermal tension can also cause glass to shatter. 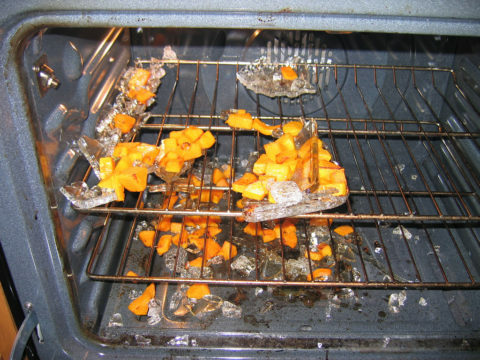 As an example, if you place a glass cooking container right out of the oven onto something much cooler (such as a damp or wet countertop), the glass container could shatter. With thermal tension being the cause, it could easily be seen as an explosion — because glass will definitely be flying about. Thermal fatigue can also be a factor in older cookware. When small cracks develop over time — some so small they can’t be seen by the naked eye — the change in temperature can be enough to cause the glass to shatter. Include just the slightest chip on the edge and bingo, the next time in the oven may be the last. With regard to the exploding Pyrex phenomenon, many have pointed the finger at the fact that Pyrex has altered its recipe for making glass cookware. In the past, Pyrex was made from borosilicate glass. But now, as a cost savings measure, it’s made from heat-strengthened soda lime glass. Soda lime glass experiences 3 times more thermal expansion than borosilicate glass — meaning the potential for shattering is 3 times higher. As with many things, there is a trade off. While thermal expansion may be greater with soda lime glass, its mechanical strength when heat treated is more than double that of borosilicate glass. What this means is soda lime glass bakeware is much less likely to break when dropped or hit against something. Understanding the physical properties of various types of glass is a bit much to expect from the average consumer. If glass bakeware is chipped, cracked, or scratched, it’s time for it to be retired from service. It is more likely to shatter! Don’t take glass bakeware directly from the freezer to the oven, or vice versa. Allow the oven to fully preheat before putting glassware inside. Don’t add liquid to glassware that is already hot. Cover the bottom of glass bakeware with liquid before cooking meat or vegetables. Don’t put hot glassware on the stove, on cold or wet surfaces, on the counter, or in the sink. Instead, place it on a dry cloth pot holder or towel to completely cool first. Follow the manufacturer’s recommendations by not using glass cookware on the stovetop, under the broiler, or in a toaster oven. Many consumers can confirm the fact that glass bakeware, including Pyrex and Anchor Hocking, does break or shatter on occasion. The good news is it’s relatively rare. Pyrex indicates that the safety of its products is demonstrated by the fact that there has never been a Pyrex recall. With proper use and care, Pyrex stands by the statement that Pyrex cookware and bakeware has a reputation of being a quality and safe product. Anchor Hocking attempts to dispel the myths associated with exploding glass cookware with these Anchor Hocking bakeware facts, which include the company’s overall safety record. Since then [1 year earlier], we’ve analyzed reports of 145 new incidents, most of which were sent to us by readers. For our previous story, we examined 152 reports to the Consumer Product Safety Commission [CPSC] about baking dishes from leading brands Pyrex and Anchor Hocking. But the new batch of reports also involves 8 glass bowls and 7 measuring cups. Though the cases we reviewed represent a tiny fraction of the hundreds of millions of pieces of glass bakeware in use, we still believe further investigation is needed. The CPSC says it is monitoring the safety of those products and encourages people to report shattering incidents; go to www.saferproducts.gov.